Mission: The Missouri Family Trust Board of Trustees is designed to provide persons with a mental and/or physical disability a better quality of life, from funds received through the trust without endangering governmental entitlements for which they are or may become eligible. 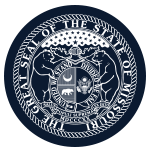 Function: The Missouri Family Trust Board of Trustees reviews and approves all governing policy of the Missouri Family Trust. Number of meetings: Four meetings; committee meetings as needed.